People starting out in business tend to seek step-by-step formulas or rules, but in reality there are no magic bullets. Rather, says veteran company-builder Norm Brodsky, there's a mentality that helps street-smart entrepreneurs solve problems and pursue opportunities as they arise. Brodsky shares his hard-earned wisdom every month in "Inc." magazine, in the hugely popular "Street Smarts" column he cowrites with Bo Burlingham. Now they've adapted their best advice into a comprehensive guide for anyone running a small business. Bo Burlingham is editor at large at Inc. magazine. He has also written for Esquire, Harper's, Mother Jones, and The Boston Globe, among other publications, and is the coauthor, with Jack Stack, of The Great Game of Business and A Stake in the Outcome. 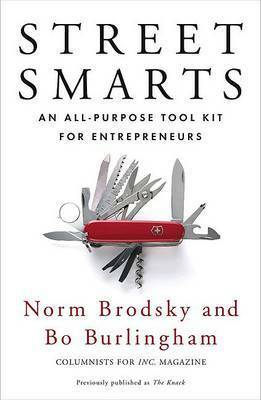 Norm Brodsky is the founder of CitiStorage and seven previous startups, and a three-time Inc. 500 honouree. He began writing his monthly Inc. column (with Bo) in 1995. He lives in Brooklyn, New York.